Bill Self admits his young Jayhawks still have a ways to go before they reach their full potential. LAWRENCE, Kan. — The admission that came from Kansas coach Bill Self was brutal in its honesty, which everyone should have expected. Self rarely sugarcoats any of his team’s shortcomings. It came Sunday, just a few minutes after San Diego State had ended the Jayhawks’ 68-game non-conference winning streak in Allen Fieldhouse, after Self was asked whether his team was as far along as he expected with Big 12 play starting up this week. "Candidly? No, we’re not as good as I thought we’d be, and our players know that," Self said. "I still think we’ll be good, it’s just taking longer than I thought." Time is running out, too. The No. 18 Jayhawks (9-4) begin pursuit of their 10th consecutive Big 12 title with a trip to Oklahoma on Wednesday night. It’s the first stop in a five-game meat-grinder against teams that are a combined 60-8, a stretch that could decide early on whether Kansas is a contender. 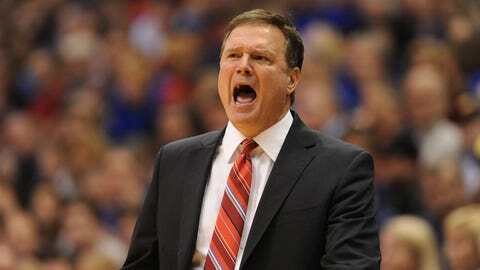 After playing Oklahoma, the Jayhawks face No. 25 Kansas State, ninth-ranked Iowa State, No. 11 Oklahoma State and seventh-ranked Baylor – all at home but the Sooners and the Cyclones. That just about makes the Jayhawks’ non-conference schedule look easy. "It’s a joke. I mean, it’s a joke," Self said. "This is the one thing I wish they could change, and there’s no way they could, and this isn’t me complaining — this is just a fact — I think if the Big 12 schedule came out earlier, that you could impact how you schedule your games." Sure, the Jayhawks knocked off then-No. 4 Duke in Chicago early this season, but they’ve mostly stumbled against premier teams. They lost to No. 8 Villanova in the Battle 4 Atlantis, dropped back-to-back road games to No. 15 Colorado and No. 10 Florida, and then lost to the No. 13 Aztecs in a game that San Diego State controlled nearly start to finish. It’s the first time Kansas has lost four games this early since the 2005-06 season, Self’s third in Lawrence. The Jayhawks lost four of their first seven that year, but went 22-4 and won the Big 12 title before getting upset by Bradley in the NCAA tournament. The last time Kansas lost four non-conference games was 2008-09, when they fell to Michigan State, UMass, Arizona and Syracuse. The Jayhawks didn’t lose their fourth last year until Feb. 9. "Our first portion of the season wasn’t that good, but the second portion, we have to become a better team, become better on defense. The real season is starting now," said point guard Frank Mason, one of four freshmen playing regular minutes. "We just have to move on as a team, and as individuals," Mason said. "Don’t worry about the mistakes you made the last game, just try to learn as much as you can." Self has had other teams that relied heavily on newcomers, but never to this extent. Those four freshmen are among the Jayhawks’ six leading scorers, topped by Andrew Wiggins, the consensus No. 1-rated recruit and an expected lottery pick in June’s NBA draft. Even when he’s had freshmen before, Self’s teams have usually been balanced by juniors and seniors who had been in the program. There were role players who had weathered everything that Self could lob at them. They had become indoctrinated in his gritty man-to-man defense, and become so adept at his high-low motion offense that there was little for Self to say on the sideline. These days, Self is usually jumping up from his seat and barking orders in the opening seconds of games, even burning a timeout after two possessions in a lackluster win over Toledo. "I think we’ve learned a lot, things that’ll help us down the road, rebounding in the clutch, last-second shots," Wiggins said, trying to put a positive spin on the season. "We just a learned a lot of stuff, and we’re young, so that’s good. You can only learn." Self has preached patience from the first day of practice, insisting to anyone who would listen that the Jayhawks were talented but green. They might still be a work by March, but they also just might have the highest ceiling of any team he’s ever had. He underscored that belief Sunday, one breath after Self finished lamenting how slow progress had been and how much farther his team still had to go. "We played a monster schedule, no excuses, but I wish we’d done it a little different," he said. "We know now exactly who we are and where we’re at and what we have to do to try and get better."